Here’s the latest winners from Montana Moves and Montana Meals. UM Missoula swept the April winnings! Montana Meals April COTM winner is Bonna Graham-Hall from UM Missoula. Bonna won a $25 gift card from Target by submitting 3-days of Food tracking. Nice job Bonna! Montana Moves April COTM winner is a ladies walking group from the UM Human Resources Office. Submission was made by Kristin Person. Our MUS Wellness Team is hoping to join this group soon for a walk and some treats! We also need to announce our Montana Meals Quarterly Prize winner, Lynda Hoover. Lynda is one of our Wellness Champions from MSU-Billings, and she won a new stainless steel cooking pan. Happy cooking Lynda! 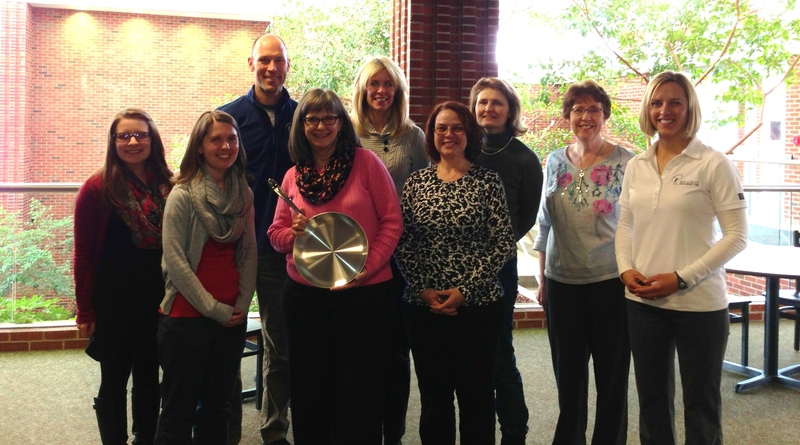 Montana Meals Quarterly Prize winner Lynda H. with the rest of the Wellness Champion team from MSU Billings. From: Montana Moves & Montana Meals <comment-reply@wordpress.com> Reply-To: Montana Moves & Montana Meals <comment+_wn86ln-dv7pufod70ljr1@comment.wordpress.com> Date: Wednesday, May 8, 2013 8:15 AM To: “Miller, Tucker” <Arthur.Miller@mso.umt.edu> Subject: [New post] More Winners!